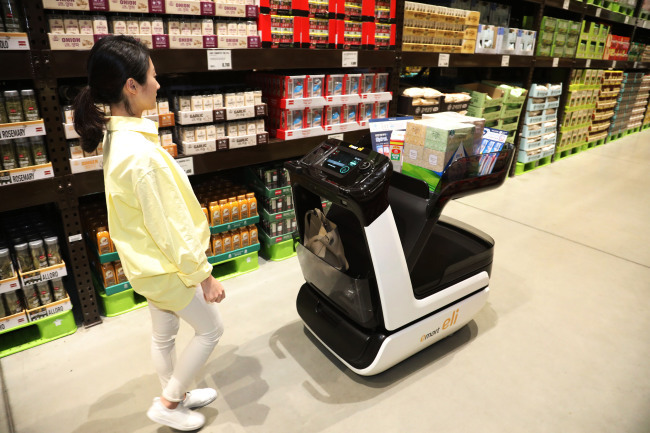 E-mart, a South Korean discount chain operator under retail giant Shinsegae, unveiled an autonomous shopping cart Tuesday for a test operation, amid the company’s efforts to solidify its offline distribution base. For the first time in Korea, an autonomous cart will be showcased at E-mart’s warehouse-style supermarket Traders in Hanam, Gyeonggi Province, from Tuesday to Friday. This comes three months after Chinese online retailer JD.com -- one of the two major e-commerce platforms in China -- unveiled a smart cart at its first high-tech supermarket in Beijing. E-mart said the cart dubbed “Eli” has smart sensors that can recognize human voices and avoid obstacles so it can follow specific consumers. It can also guide shoppers to find stock items at desired aisles by displaying the locations on the cart’s liquid-crystal display screen. Payment can be made via Eli as well, simply by using Eli’s sensor to scan the barcode of a product. A customer can then tap a credit card or Shinsegae’s mobile application SSG Pay to make payment. The cart can tell whether items in it have been paid for by comparing the weight of items, E-mart said. After shopping is completed, Eli is able to automatically queue at a charging station so customers do not need to return the cart. Other functions include searching for a car’s location inside a parking lot and checking shopping information, such as discount coupons, the benefits of a credit card and the duration spent shopping. Eli’s test operation comes less than a month after Chung Yong-jin, vice chairman of Shinsegae Group, uploaded a short video of Eli to his Instagram account last month. He has been gaining popularity on the social network, as he frequently shares photos of his market research abroad and the testing of E-mart’s new products, which often attracts humorous comments. The latest development by E-mart was led by the company’s internal technology research lab S-Lab, which was established in 2014. The lab conducts and test-operates experiments to bring new technologies -- including robots, the internet of things and augmented and virtual reality -- to the retail industry, the company said. “The company has been experimenting with a cart with cutting-edge technology for over a year, to improve customers’ shopping experience,” said Hyung Tae-jun of E-mart’s strategy division. Despite concerns over whether the smart shopping cart will be effective at supermarkets that are usually packed during weekends, industry insiders said Shinsegae’s all-out efforts to create an IT-driven shopping experience in Korea will be a prelude to smart shopping in the near future. “Backed by retail giant Shinsegae’s support and investment, E-mart will be able to take the lead among local supermarket chains to provide a differentiated and convenient shopping experience,” said an industry insider.